Chowmain develops Crestron modules for dealers and integrators to further enhance their client's projects. Module licences and downloads are available on the driverCentral store. FREE Anthem STR Module- The revolutionary STR Integrated Amplifier is based on an entirely new technological platform, for true benchmark performance in stereo amplification. More power, more control, more connection options, and the most advanced technology available in a single, easy-to-use component. The Anthem STR Module for Crestron enables full two way control over the STR range of products by Anthem including volume, mute, input, presets and more. FREE Klipsch C Series Subwoofer module - The Klipsch C Series Subwoofers take performance and style to a new level. This FREE module developed by Chowmain will integrate the C series of Klipsch subwoofers via IP for full two way control including discrete input switching, volume, EQ preset control and more. FREE Klipsch KDA Series Amplifier module - The Klipsch KDA Series DSP Amplifiers offer legendary Klipsch power and performance in a sleek, high-tech, 1 rack unit solution. This FREE module developed by Chowmain will integrate the KDA series of Klipsch devices via IP for full two way control including volume, mute and discrete input changing. 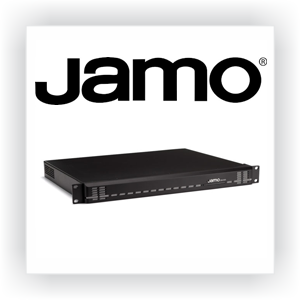 FREE Jamo JDA Series Amplifier module - The Jamo JDA-500 offers legendary Jamo power and performance in a sleek, high-tech, 1 rack unit solution. This FREE module developed by Chowmain will integrate the JDA series of Jamo devices via IP for full two way control including volume, mute and discrete input changing.